Well done! Very definitely spoiled in that area, having Jason close at hand. Tai’shar Dragonmount! Herein is the Memory Keeper report from the San Diego visit on the A Memory of Light book-signing tour, 6 February, 2013. Faithfully submitted by Freelancer. Before getting to the event itself, a little bit about the location. Mysterious Galaxy is a wonderful independent bookstore in the heart of San Diego, focusing on Sci-fi, Fantasy, Mystery and Horror literature, run by a dedicated and knowledgeable staff of fantasy fans. The store manager, Patrick Heffernan, coordinates author signing events each and every week, as many popular authors wouldn’t consider a promotional tour complete without a visit there. You can learn more at http://www.mystgalaxy.com/ As for the Memory Keepers, there were eight selected by the Dragonmount staff, but unfortunately one, Eric, was transferred by his military command prior to the event. There rest of us included Justin, our “First Among Equals”, Alexei, Chris, Christopher, Lindsey, Manuel, and Tim. All were able to be on hand early and assist the store with rearranging bookshelves, setting chairs, and whatever other setup needs the store required. Fans began arriving as much as an hour and a half prior to the scheduled start time of 7PM, and not long after 6PM all of the chairs were occupied. The mingling crowd wasted no time in chatting each other up about the series, speculating on what questions would and would not be asked or answered. At that time we began passing out copies of a fan-created Wheel of Time crossword puzzle (thank you, Wetlandernw! ), and a logic puzzle designed by Memory Keeper Justin. Attendees dove right into these while waiting, and in spite of our best attempts to keep folks “honest”, many smart phones and tablets were put into action hunting answers from numerous Wheel of Time resource sites. Brandon and Harriet arrived around 6:15 and went directly to work signing store stock books for almost twenty minutes. Brandon then broke away and pulled the Memory Keepers outside of the store while Harriet continued. He greeted us all, thanked us for volunteering and offered his congratulations on being selected. He then explained that Harriet’s travel schedule still had her on Eastern Time, and she wouldn’t be able to remain for the entire event, so the sequence would have to be adjusted, and the usual sit-down time with the Memory Keepers would unfortunately fall victim, but that Harriet would spend some time with us on site before leaving. Next he asked if we had all finished A Memory of Light, and with seven nodding heads, said that we were free to ask any questions, even AMoL spoilers, before going back in with the crowd. The non-spoiler questions will be included at the end of this report. After we re-entered the store, Harriet turned around while in the midst of signing books, and got the crowd’s attention. 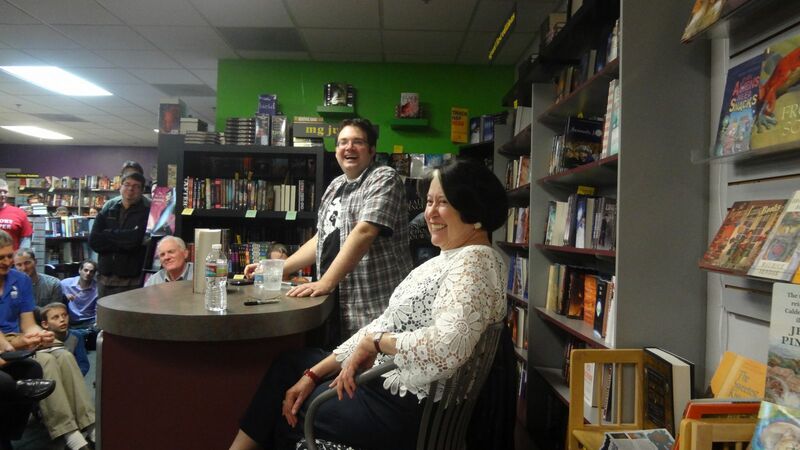 She pointed out a photo of Robert Jordan which has hung on the wall of the store for as long as I’ve known of the place(and is the feature photo on his Wikipedia page), and said that it was taken in this very store during the 2005 tour for Knife of Dreams, his last book release tour. She asked if anybody there might know who took the photo, for she had always treasured it. Lo and behold, two hands shot up, belonging to people known to the tor.com re-read as BaboKathy and insectoid. A close family friend had taken the photo, and they were there as well at that time. Harriet then produced a DVD of photos from that day’s event, and asked if they would get it to the woman who had taken the photo. It was a very lovely gesture, and a moving moment. A bit after this, a few moments of getting people and things settled, and Christine, one of the store employees, delivered a formal introduction for Brandon and Harriet. Harriet expressed her thanks for the great support of the fandom, and then began stating numbers: 23 ~ Years since the publication of The Eye of the World. Brandon broke in on this and asked how many others began reading the series in 1990 as he had. Still a fanboy after all these years! There were more than a handful, and more on that later. 9,995 ~ Pages in the first edition hardcovers of the series proper (excludes New Spring) 14 ~ Volumes in the main series Brandon spoke briefly about finishing the series, and then began the Q & A session. Q: About Androl and Pevara, the dynamic and internal dialogues were right on, and his unique skills made for some of the most remarkable scenes since the cleansing. I know that RJ had some things lined out for many of the characters, but you sort of took Androl on as your guy, can you speak to that? Brandon: (Prefaced his answer by reminding everyone to avoid spoiler questions, and made it clear that this one did not cross that line) When I began to work on the books, I felt that with each book, it seemed that Robert Jordan usually took a side character and made them more of a main character. As I was outlining the series, I decided I wanted to take a side character and make them into more of a main character, but there wasn’t a specific person in the notes designated to do that with. But I felt that we really needed somebody at the Black Tower, because of all the things going on at that time in the notes, and we needed another viewpoint there. During my second trip to Charleston, this would be April/May of 2008, we used big sheets of butcher paper, outlining what was going on with these as a visual aid. I wanted an Asha’man to have a sequence of major viewpoints. Maria and Alan, who were Robert Jordan’s assistants, and are now Harriet’s assistants, chatted about it a moment and said you should use Androl, because there’s not a lot about him, he’s pretty much a blank slate and you can go wherever you want with him, which was really exciting for me. I then pitched the Talent of gateways for him, and they liked that. Shortly after I got home, I got in the mail a printout or photocopies, of magazine or book pages from Harriet about leatherworking, and she had written on it, “I know that Jim had planned to use this in the book somewhere, is there anywhere that you can fit it in”. Well I’m developing this character, let’s make him a leatherworker. So I used that in building the personality of who this character was, and in that way, there was some of Robert Jordan in the character, even though I was taking a blank slate and going my own way with him. And that’s where Androl came from for the last three books. Q: Did the Dark One make the True Power available to Rand, or did he find it himself? Brandon: (After staring at me for several seconds (long story) and taking a sip of water, he pulled out a RAFO card) First RAFO of the night, and it’s yours! It might be in the encyclopedia. Yes, I can still RAFO. Q: Which character’s contribution to A Memory of Light did you enjoy most? Brandon: This book was supposed to be about Rand, and so Rand’s contribution is the most important to me. So much so, that in the revising process we felt several times we needed to bring out more. One of the big elements of revision was, we needed to make sure that Rand remains the focus of this book, and even though things are going where there are lots of different sections and regions where Rand is not involved, we needed Rand to be at least the heart of the book. Q: Harriet, will you speak to how you came to choose Brandon to finish the series, and Brandon, how it was to be selected? Harriet: Well, I don’t know that this isn’t all over the Web, so most of you probably already know the story. (In the interest of space, I agree, and the details of this can be found among Brandon’s own blog entries on www.brandonsanderson.com, an interview on tor.com, and other places. I feel Compelled, however, to provide a verbatim transcript of a piece of her commentary) Harriet: (After having read Mistborn and feeling that Brandon was the right fit for the work) And then, in a very unprofessional way, I called information for Provo, Utah, and asked for Brandon Sanderson’s phone number. And I got it!. So a woman picked up the phone, and I said “Hello, is this Brandon Sanderson’s number?”, she said “Yes it is”. And I said “Well, I’m the widow of Robert Jordan, and I’m calling to ask whether Brandon Sanderson would like to be considered on the short list we’re compiling”, and it was a short list (holding up a single finger) “to finish Robert Jordan’s fantasy series.” She said, “I have no idea what you’re talking about.” And guess what? Provo, Utah has at least two Brandon Sandersons. So then I remembered that I was a publishing professional, called Tor, and said “what is Brandon’s number?” Q: Can you talk a little bit about the River of Souls sequence? Brandon: Yeah, I can totally talk about this. So, River of Souls is about a specific character, and in the drafting process this is not something I actually pitched to Harriet early on, but in the later meetings I got together with them and pitched something which was a deviation from things Robert Jordan had said. Harriet told me from the get-go, Look you’ve got the notes, you’ve got the outline, you’ve got to be a writer, not a transcriber. Robert Jordan would not have kept this the way it is, that’s not how we work, and in a lot of places he said I’m thinking of doing this, OR this, and you’ll have to decide which of those to do, or to do a third. And so I pitched one of these kind of audacious sequences to her; sometimes these work, sometimes they don’t. It’s the sort of thing you need to do to create fiction, that I feel is daring, and you need to take these chances. But a lot of times you don’t know if it’s going to work until the book is done, and you can look at it together. And this was taking place in a region of the Wheel of Time world that Robert Jordan said I really don’t think we’re ever going to visit. Which is the part that was deviated, by doing this sequence. And it’s not that long, only about 7,000 words, so it’s like a novelette. I sent it to Harriet, and she said “I really like this, but we’re going to cut it”. The reason being, that it broke up the flow of the novel, and it was introducing too many new elements at the beginning of the volume that was supposed to be wrapping up elements. And those who do storytelling know that can be a really dangerous thing to do. Harriet: That was the reason. It was a big additional segment, and this is not what you call a slim volume anyway. So as a reader, it was not fun. Not that there was anything wrong with the sequence, but it was not what my antennae said we needed. We needed to get on with it. Brandon: Yes, instead of going sideways, when we needed to go forward. Q: I was wondering what inspired you to write your own things, and what were some of the first steps you took? Brandon: That’s an enormous question. Listen to Writing Excuses, I’ll talk about that later. What started me? I was kind of a lost boy in school in middle school. I didn’t do bad, I got Bs and Cs. I didn’t have passion about anything, I was just kind of wandering. And then, I discovered fantasy novels. And it’s dumb to say, but fantasy novels changed my life. I don’t know why. Now, as a 37-year-old, I can look back and say “Well, obviously, it was THIS” But I don’t know what it was. I discovered specifically Dragonsbane, the works of Anne McCaffrey, and the works of Melanie Rawn. Which were right after one another in the card catalog, and they all three had Michael Whelan covers. And I don’t know why, but those three things grabbed me, and then I realized this is what I wanted to do. I realized this is a job people do, and it’s awesome. So I told my Mom, and she said “Well, you better get better grades, then.” That’s what my Mom does, she’s an accountant. And I got straight A’s in 9th grade. I did. Because I’m like, I now know why I’m doing this, and I have to be literate if I’m going to be an author. So it’s hokey to say “Fantasy novels saved my life”. They didn’t save my life, but they sure changed my life. Q: Of Rand’s three girls, who is your favorite? Brandon: Aviendha. Easy answer there, definitely Aviendha. Q: Can you talk more about (deleted) in the Blight? Harriet: No. Brandon: No. Spoiler! No spoilers please. Q: Two questions. One, who killed Asmodean? And the second one, the Aviendha scene with the rings (sic), going back in time, and then into the future, was that part of the original intention with Robert Jordan, or is that something you kind of improvised. Harriet: Can I take the first question? Brandon: Yes, go for the first one. Here's a youtube clip of Harriet's answer: Harriet: The first question, simply illustrates the importance, as every sister of the Brown Ajah knows, of reading the glossaries. Brandon: I’m not going to give you a very good answer on the other one either. The reason being, we try to keep away from saying too much about what Robert Jordan did, and what I did. Particularly while there are people who haven’t read the books yet. Maybe in a year or two we can start being more open about these things, but right now, I don’t want people reading the books and focusing on “Was this Jim, was that Brandon?” and things like that. The only answer I can give to questions like that is every scene is 100% Robert Jordan, and 100% me. Q: Are Robert Jordan’s notes going to be included in that encyclopedia/anthology you’re working on? Harriet: The notes? The notes are more words than have been published in the entire series. Brandon: Harriet, did you hear that I tried to make one file out of the notes? Did Maria tell you? Earlier this week, I actually said people ask this all the time, I’m going to have an exact word count for them. So I took every one of the notes, and I compiled them into one Word document. It got to 32,000 pages, and Microsoft Word said ‘I can’t count any further’, and my computer crashed. Thirty-two thousand pages. Harriet: So the answer is no! Brandon: The whole series is ten thousand, ok? And this was thirty two thousands pages. It crashed my computer, Harriet, it was hilarious. It was at four million words plus counting, it was continuing to go, and then it couldn’t go any further. Q: A compliment to you, Harriet and the entire team that put this together, but the really stunning thing about the last book was how many characters had a role in this book, down to multiple dozens of people, secondary characters and below. How did one do that? How does one create that continuity? Obviously some of it comes from Jordan’s original work, but how does one pull that all together? Harriet: Someone in the audience said “magic”. I don’t know that there’s a better answer. Brandon: It was the biggest challenge of this last book. I’ve said for years, even before I was involved in the project, once you hit book seven in the Wheel of Time as a reader, you have to realize something that I realized. The series itself is not about Rand. The series is about all of these people facing the end of the world. Rand of course is at the center, and there are other figures close to the center, but the series is about all of these people. And going into the last book we all felt that the last book needed to evoke that. Rand needed to be the heart, but it needed to be about the world, all of these people facing the end of times. That was something we struggled with, went back and forth on. The creative process is a mysterious thing, even to us involved. I’m glad that you felt that, because when I went into it that was one of the things I said, this is what we need to do, it needs to feel like this, and if we are successful, that’s what it will feel like. Q: There was some little inconsistencies in the lengths of chapters, especially kind of in the last book… Brandon: Oh, you’re talking about the several hundred page chapter, and then the five page chapter? Q (cont’d): …was that sort of picked to try to break up things specifically, or was that more in how it fell out? Brandon: The chapter lengths, in this book in particular, were very consciously chosen. Under Harriet’s direction, through the first two books Harriet came to me a lot and said “No, this chapter needs to be these viewpoints, and this chapter needs to be those viewpoints”, and she actually taught me, I don’t know if she realized that she was doing it, and then in the last book, she didn’t have to do any of that. There was no changing of viewpoints between chapters. (Meaning via revision) Harriet had trained me better in chapter breaks and things like that, so I broke up the chapters. (To Harriet) I don’t know if you even noticed that, in the previous two you did a lot of that, and this one you didn’t. The very long chapter, a very, very long chapter, you can see it in the Table of Contents, the purpose of that is, I wanted you to feel like the characters do in that chapter. They can’t put down their weapons and go to sleep. I don’t want you to be able to put down the book and go to sleep. I want you to hit that chapter at 1AM, and be like “I gotta to be at work at seven, and I’ll read just one more chapter”. One of the things Harriet unconsciously showed me that I picked up on, was the use of chapters for that kind of narrative structure in a better way, so that was done very intentionally. Q: I’ve really enjoyed it, I’ve read book twelve and thirteen, it’s always kind of difficult to get a transition between voices of different authors, but I’ve really enjoyed the last two books. Was there a particular character that was difficult for you to write? You don’t have to answer if you don’t want to. Brandon: No, no, I can answer, I’ve answered this before. I would say that the toughest character to get right was Mat. His voice, he has the most distinctive voice in the entire Wheel of Time. Robert Jordan had perfected that voice, and if you read the series, Mat as a character evolves to the point that in book ten he’s just this majestic . . . piece of work. Piece of work used as, yeah. And he’s just amazing, and to go from like book ten and eleven, Robert Jordan at the height of his skill, telling of this character that’s very difficult to tell, and me then trying to do it, I think is also the most jarring. So he was tough, and I’d say the other tough one was Aviendha. Getting the Aiel right, because Robert Jordan had a lot of experience with the cultures he was basing the Aiel off of, and I don’t have much experience with them, I have experience with the Aiel only, if that makes any sense. And the first time I wrote Aviendha, Harriet sent me the chapter back and said “You’ve written an almost perfect Elayne”. And I’m like “Oh, great!” Well, I know I’ve got Elayne down then. I got her on the third try, and she said “Ahh, you’ve got it”. But it took me several tries to get Avi right. Q: In the Mistborn series, I read on one of your posts online that you had a rough outline of how the series would have gone if a major death in the first book hadn’t happened? I was just curious how that would have progressed if he was still alive? Brandon: He would have taken over, because that character doesn’t not take over. And it would have been a very different series, it would have been more heist focused, and not so much epic fantasy focused. Q: Would he have finished everything up a heck of a lot faster than Vin and Elend did? Brandon: Worse, but yes. Things would have gone very differently, how about that? The reason I decided it couldn’t go that way was because I think the series just wouldn’t have worked. Q: Are there any discussions in place to convert these books to audio books? Brandon: They are already all on audio book. (The man was actually standing very close to the rack full of audio volumes) Q: So you don’t want to answer questions about which scenes you wrote and what scenes Robert Jordan wrote, but has anybody come up to you and said like “I think you wrote this scene”, but actually Robert Jordan wrote that? Brandon: All the time. And it’s awesome. I’ve released a few things, and if you come up to me later I’ll tell you exactly what scene it is, so I’m not spoiling it for others. But there’s one that everyone’s like “I can so see Sanderson’s hand in this, look at this and look at this” and one of the things they say is “Sanderson uses contractions, and Robert Jordan doesn’t use contractions, for the character POVs”. But Robert Jordan did in his notes, he just took out the contractions later on. And that was a scene I posted in exactly out of the notes, and it was hilarious to me. That was all the time available for questions. Brandon then said “We are going to do a very short reading, and what we’re going to do is have Harriet read to you one paragraph.” To which Harriet replied “I was afraid that’s what ‘we’ meant”. So Harriet read the first paragraph of the first chapter of the last volume of the Wheel of Time. It is verbatim identical to the same paragraph in the Eye of the World, because the wind rises out of the Mountains of Mist. When she came to the final phrase, she invited the crowd to recite with her, “But it was a beginning”, which drew a huge ovation. And with that, we finally arrived at the book signing portion of the event. Brandon gave instructions, that with the first pass through the line no personalizations would be done, only basic signatures on no more than three books. Any more books, or any personalizations, meant waiting for a second pass through the line. This was primarily so that Harriet wouldn’t be kept there any later than necessary. A fair estimate is that around 350 people were in attendance, with 214 ticket numbers issued by the store for the purchase of A Memory of Light. While the signing line progressed, the Memory Keepers got busy again, handing out WoT postcards and pamphlets, as well as games of hangman and asking random trivia questions of the fans, and offering the nifty WoT swag provided by Tor for the event. Everyone was patient, kind, and enjoyable. Folks with high numbers left to grab a meal instead of standing still, and some of the folks with low numbers just hung around awhile longer chatting and checking out all of our various trivia items. Once the first pass through the line was completed, the Memory Keepers got a turn. First for a group photo with Harriet and Brandon, and then to get our books signed, and to ask a few more questions, including AMoL spoilers, as long as nobody else was able to hear. Harriet was gracious, funny, and effervescent, in spite of the time (about 10:15PM by then, or 1:15AM in Charleston). Then off she went back to the hotel, while the die-hards came back through the line to get more books signed or personalized. Well, that was about it. Brandon stayed until just after 11:30PM, signing personal and store books, including some bought online or over the phone while he was there. He was, as always, just as happy to be around the fans as we are to be around him. On behalf of the San Diego Memory Keepers, special thanks to Dragonmount for selecting us, Mysterious Galaxy for hosting another excellent event, Tor books for sponsoring the tour. We had a blast. Following are some questions asked and answered at the signing line, and from the Memory Keepers. Q: Regarding the cache of ter’angreal recovered from Ebou Dar, and identified by Aviendha, were no more of them employed than we’d seen due to space or continuity constraints, or were they never intended to be used? Brandon: We used what was given to be used in Robert Jordan's outline and notes. It may be that he would have found a use for more of them, but we stuck to what he had prepared. Q: Was Verin involved in the attack on Demira Sedai in Caemlyn? If not, was it on orders from the Tower Aes Sedai, or Daved Hanlon, or?? Brandon: RAFO. There are plenty of “loose ends” that may end up in the encyclopedia, and this is just the sort that I don’t want to spoil. There will certainly be some details about Verin in there. Q: In The Shadow Rising, in the Stone of Tear, Moiraine tells Nynaeve, Egwene and Elayne that she knows the face of her husband. She hasn’t been to Rhuidean, or even to visit the Aelfinn yet. Does she have this knowledge from a vision of Min’s, and if not, where? Brandon: No, she had been through the twisted doorway, hadn’t she? You’re sure? Then I don’t know, perhaps that one can be asked of Maria. Q: Regarding Gawyn and Elayne, among many readers they are two of the least liked characters on the Light side. Do you believe that Robert Jordan intended for them to be viewed with such negative reactions? Brandon: Elayne, no not really. Gawyn, though, he’s the Fallen Prince archetype. Everything he does comes up short, which leads him to just be trying too hard. Hello, Jennifer. Not sure if this is the best way to reach you. I'm one of the Memory Keepers for the San Diego tour stop, and I can't seem to find the Memory Keepers forum that I hear tell of. Any help would be lovely, thanks.